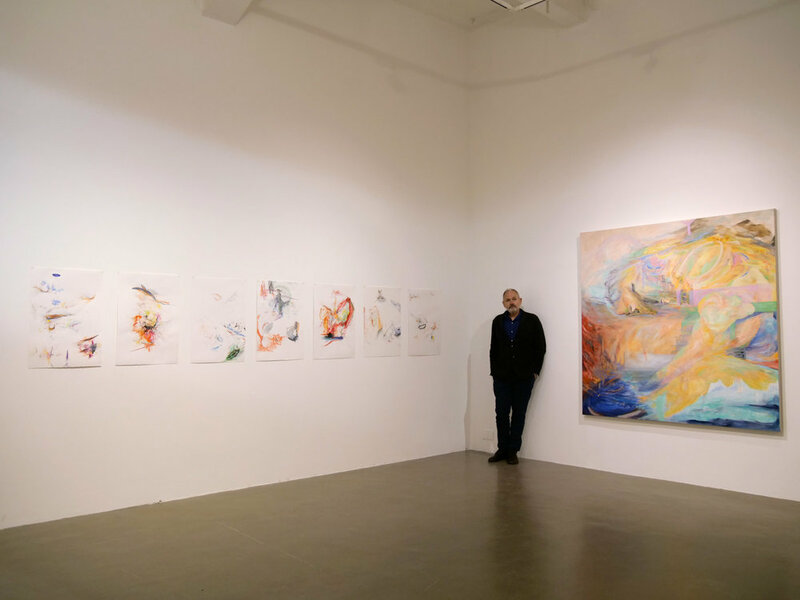 I am very happy that Neil Goldberg, guest curator from Yale featured my work on @foundwork.art besides two other painters, Ann Toebbe (Chicago) and Lauren West (Brooklyn). Marius von Brasch (b. 1958, Cologne, Germany;@mariusvonbrasch) is one of the latest artists featured in our Guest Curators program on Foundwork. von Brasch was chosen by Neil Golderg (@shecky2000), an acclaimed American video, photo, mixed media, and performance artist represented by Cristin Tierney Gallery, New York, and a Critic at Yale School of Art. About von Brasch’s practice, Goldberg comments that "I love the dynamic between restraint and exuberance in Marius von Brasch’s work. 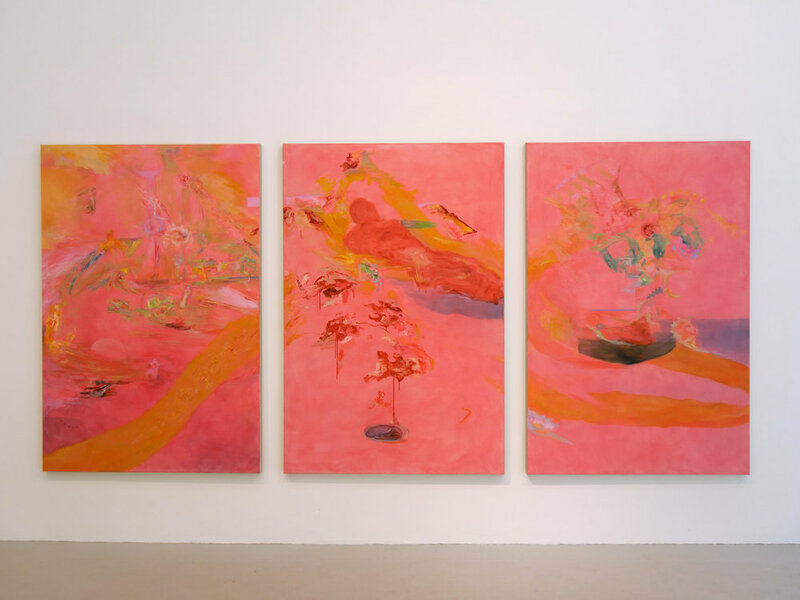 In his spare drawings, the marks tend to engage each other from a respectful distance; in his paintings, the visual elements—rendered in hyper-saturated pinks, oranges, and greens—are inclined to commingle ardently." 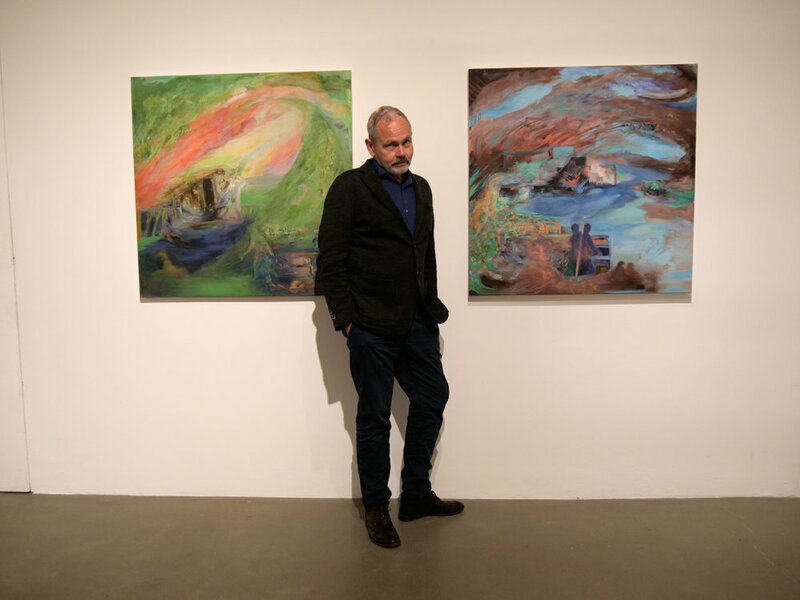 As Goldberg observes—and as you can see by swiping left here—there’s a notable duality in von Brasch’s work between compositions that are dense or sparse, permeated with color or situated largely on fields of white. We love how this formal dialogue helps us to better recognize not only those differences but also the stylistic harmonies across von Brasch’s practice. Neil Goldberg is an American video, photo, mixed media, and performance artist. 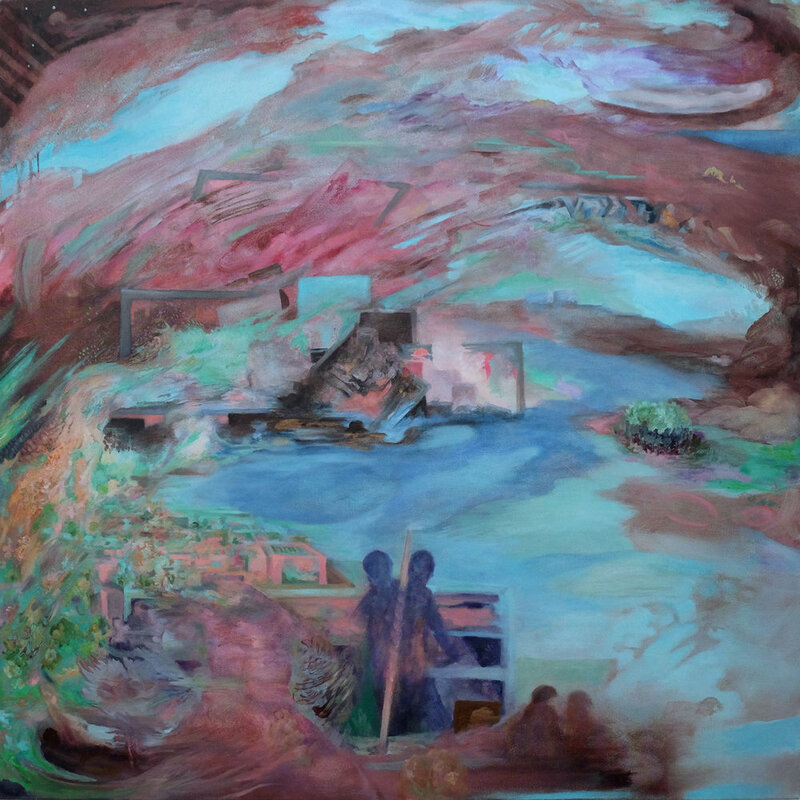 His work has been exhibited internationally at venues including the Museum of Modern Art, New York (permanent collection), the New Museum of Contemporary Art, The Kitchen, the Hammer Museum, and NGBK Kunsthalle Berlin—and has garnered fellowships from the Guggenheim Foundation, New York State Council for the Arts, and the MacDowell Colony, among others. Goldberg is a Critic at the Yale School of Art and is currently a mentor with Queer | Art | Mentorship. He is represented by Cristin Tierney Gallery, New York, and a monograph of his photographic series, Other Peoples’ Prescriptions, will be published this spring in collaboration with Esopus Books. 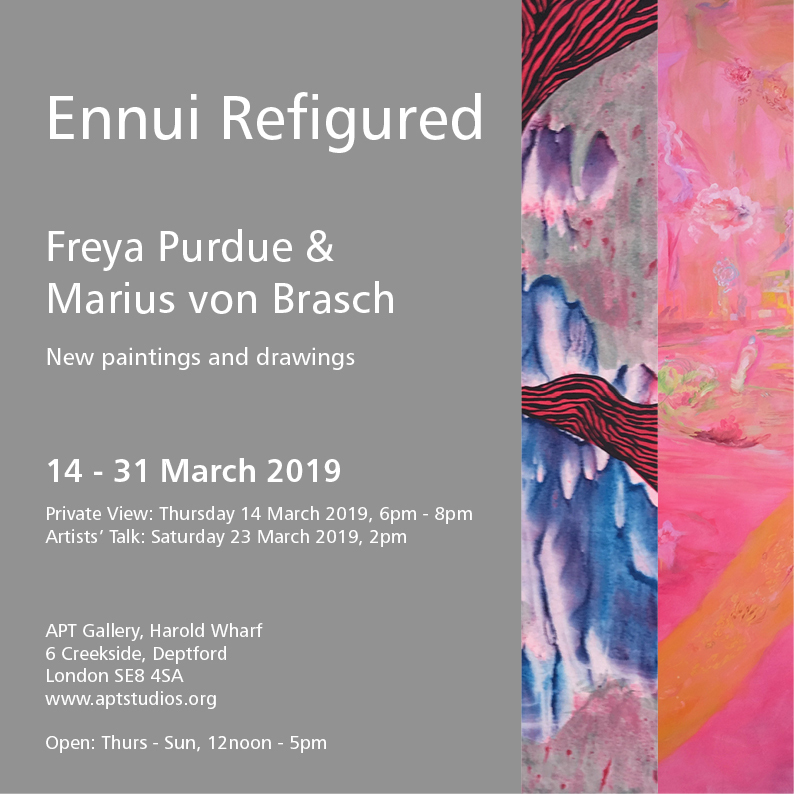 In March this year, two important moments for me coincide: there is Ennui Refigured opening at APT Gallery on 14 March in London, a joint project with Freya Purdue, showcasing a selection of our new paintings and drawings (here's a link to my newer work). Then there is, opening on the same day, Made in Britain - 82 Painters of the 21th Century at the National Museum in Gdansk, Poland. I felt honoured end of last year when 2 of my paintings and a series of drawings became part of the Priseman Seabrook Collection. Made in Britain showcases parts of the collection, amongst them one of my works (Preceding/Forgotten Spaces 1 from 2010). 'According to Ian Buchanan in a recent text, there is a move in the current mode of appreciation of art toward the small screen of mobiles and other electronic devices, which provide a somehow perfect and self-reflective antidote for boredom. Von Brasch and Purdue propose their visuals - in the face of the ‘new’, the fleeting mass commodity - as possible anchors for absorption, contemplation and non-expectation in the anonymity of the gallery. For this show we currently produce a catalogue with an introduction written by artist and writer Ella Clocksin. We will talk about the works and the leading idea behind on Saturday 23 March 2pm, Ella will moderate this talk. Made in Britain will run from the 14th March to 2nd June 2019 at the National Museum Gdansk. The opening reception is on the 14th March at 6pm. Talks and exchanges with the Gdansk Academy of Fine Arts are also planned for the 15th and 16th March and there will be a finishing event on the 2nd June. The second Portfolio Preparation Course, organised by Nick Martin and Quay Arts, is now a condensed 25 week course, rather than 30 weeks like last year (these changes will be updated on Quay Arts website). 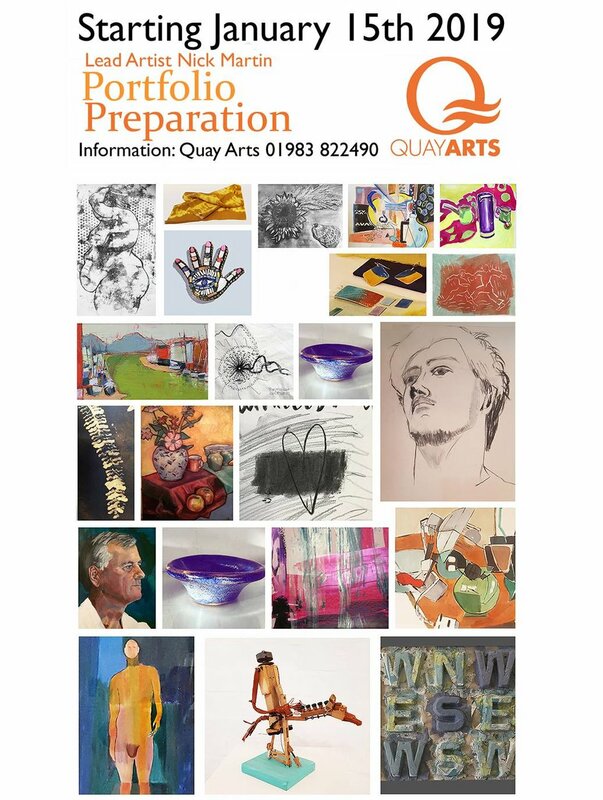 It has been very well received and will be running this year from March 12th to 26th November at Quay Arts, with an exhibition showcasing the students' works at the end, the dates have changed from the ones stated in the weblink and will be updated. I'll be teaching two full-day courses, 'Let paintings emerge' and 'Hidden structures in paintings'. 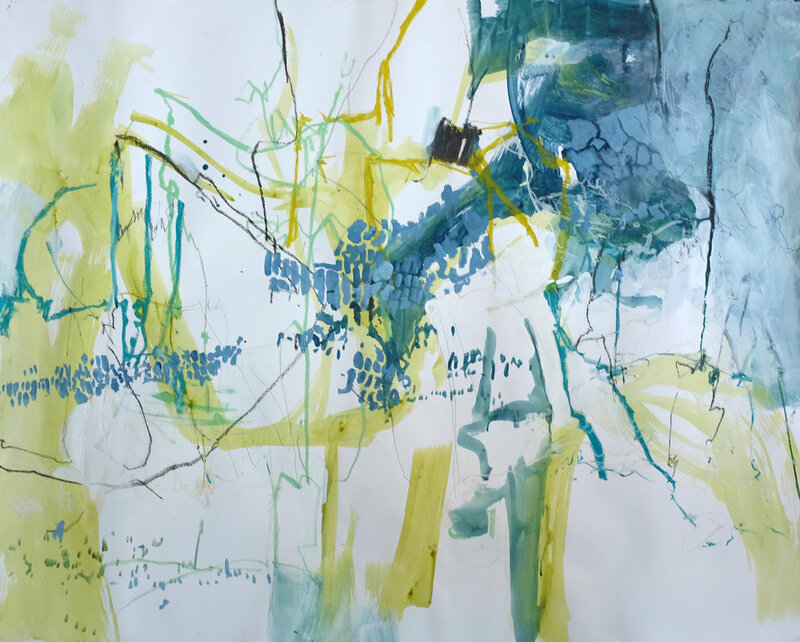 For the weekend 9th/10th November this year I plan an exhibition of new paintings by Ella Clocksin (above a work on paper by her) in my studio in Rookley. I have known Ella for a long time, we have curated together, had endless talks about art, and I believe that her new works will contribute something special to the audience here on the island. The exhibition will also include a conversation with Ella about her work on Sat 9th. As she is also an accomplished writer, it makes only sense to have a look at her website and her artist statement. This event is meant also as an opportunity to meet each other; Michael and I plan to host Sat 9th evening after the talk with something small to eat and some drinks after the show. Today, Sat Dec 2nd, is the last day of the Illumination show at West Gallery, Quay Arts, showing my newer paintings, drawings (all the more colourful works in the clip) and a projected video (you'll see just a green 'break') , alongside Howard Hardiman's digital drawings (b/w, framed) and videos on monitors. We got very positive feedback, and honestly, I'm glad that the talks and events, as satisfying such exposure to audiences can be, are behind me; despite putting on my professional head and trying my best to put out what could be of interest for others, I have to overcome a great shyness each time talking about exactly those things that are painted/drawn/filmed so as to not to have to speak. And even the speech layers in my video are certainly not intended to explain a lot. And yes, it's great to share these things - a strange yet rewarding experience. Thanks again to Georgia Newman, our curator, who came up with the idea to put our work together and L love the way it has been presented at the Quay. A while ago I invested into an archival ink printer, which definitely delivers the results I had in mind. Following some experiments and new work with it, I have started now to print my own limited editions of original digital image files (Digital Collages); plus also reproductions i.e. photographs of my paintings, which I take myself. The paper used these prints is a quite thick matte Fine Art paper by Hahnemühle (308 g Photo Rag), which lets the colours appear rich and vibrant like in the originals, without the sheen of glossy papers. Archival inks (UltraChrome HD Pigment Technology) won't fade in about 200 years. I produce these prints carefully myself, so they reflect my idea of how they should look like both as digital originals (limited editions) or reproductions of a painting. Now available to buy directly from me in a new section of this website Prints/Books. There are two versions available, on A3 or A2 paper. Prices are £ 31.50 for prints on A3 and £ 47 for prints on A2 size paper. The prices include 1st class Royal Mail within the UK in a wider tube. For international orders please contact me before you order. End of last year I started running workshops again - Becoming Visible took place a few times in my studio, each time different, and I had the feeling for most of the participants it has been a journey of discovery, rewarding for them as much as for me. It feels an honour to be involved in someone's progress as a person and an artist, each time something really special, individual, unrepeatable unfolds, and I am learning from it myself, each time again. Quay Arts IOW agreed to offer a class, Drawing/Painting from Within in their framework of their Summer School in August this year. As this class is already fully booked, I think currently about offering a 2-day course in October, here from my studio. Please let me know if you are interested. In December this year, I will be curating a show again at The Studio at Rookley Manor - the subject this time is Stories/Narrative. Stories in visual art have been somewhat tabu because of the element of illustration vs. art - but walking through a visual in one's mind composes certainly a story-line, whatever fragmented, doesn't it? This will be an exciting showcase of a variety of brilliant artists and their visions towards how we understand stories very differently, and how those stories build another story when they come together. 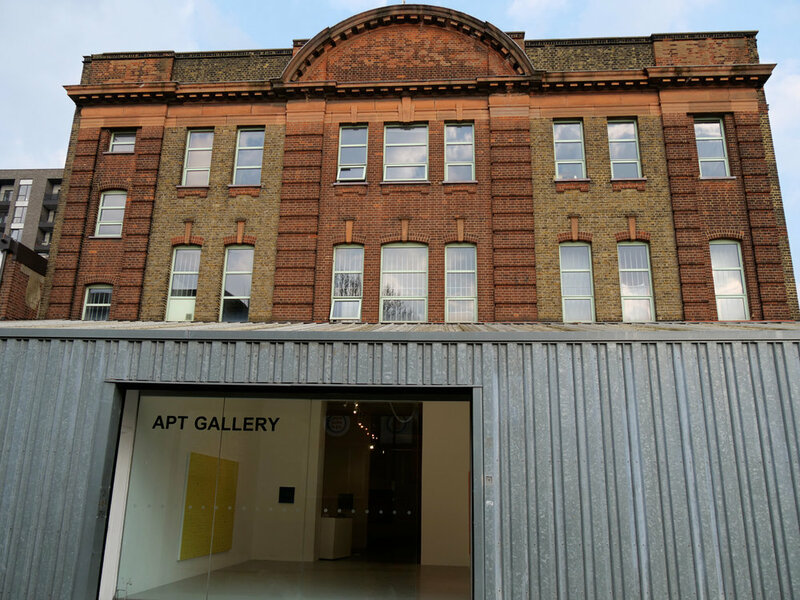 Artists invited and confirmed: David Firmstone, Ella Clocksin, Howard Hardiman, Jan Williams/Chris Teasdale - The Caravan Gallery, Lisa Traxler, Michael Bartlett (and myself). The show will launch on Saturday afternoon Dec 10th and run for another day on Sunday. Mike helps me profusely with the preparations, wine will be catered by Winetherapy in Cowes. For a while now, I have been planning with Howard Hardiman a bigger exhibition project exploring how we can approach mythologies, the notion of transformation and alchemy from a contemporary angle. Our interests match, and we are definitely very excited to have been offered funding for this show from the Arts Council England. 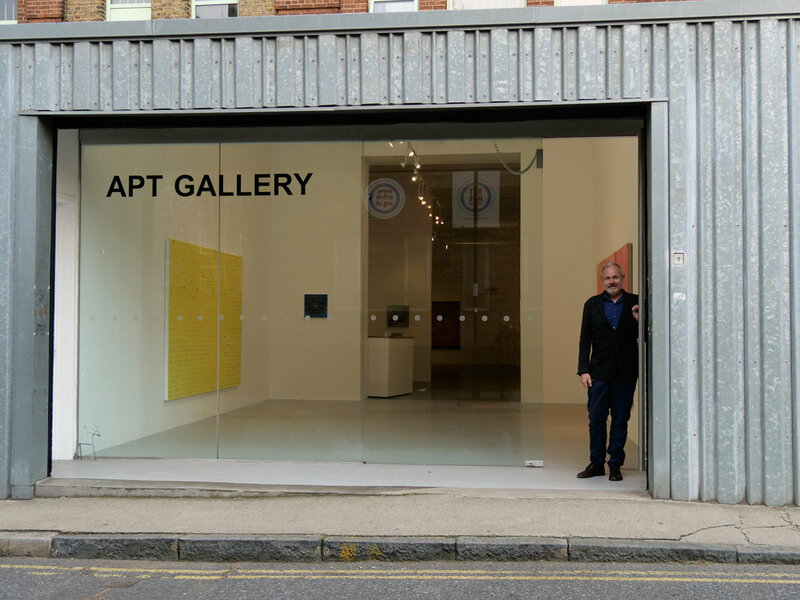 The exhibition will run last quarter of next year at the West Gallery at Quay Arts, with the possibility of touring to other places in the country. I look forward to a quite intense work phase! I’m excited about offering my workshop module, which I have run over many years from my studio (first in Southsea, recently from Rookley) now at Quay Arts Summerschool.